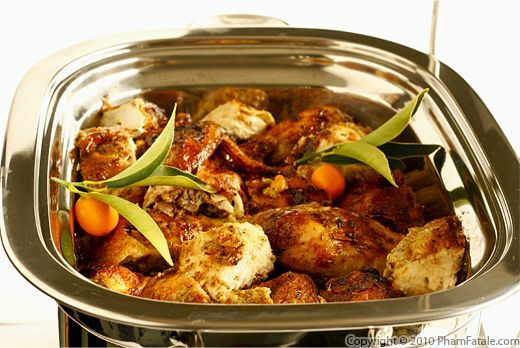 The strong flavor of kumquat takes roasted chicken to another level. I marinated the chicken with kumquats and finished the dish by brushing the poultry with a kumquat glaze. The final product was tender and tasty with a crunchy skin. 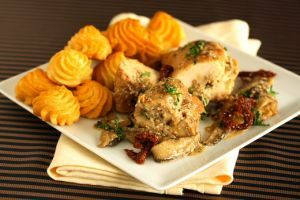 I served the chicken as one of the dishes for our buffet-style dinner party. We had about 15 people at the house, so I roasted 3 whole chickens. I carved the chickens and placed them in a chafing dish with the chicken drippings at the bottom of the dish to prevent the chicken from drying out or burning. There were literally only a few wings left, so I think it worked out pretty well. Our tree is absolutely bursting with kumquats, so if you're a fan of the diminutive citrus, stay tuned, because I'll be posting many more recipes in the near future. Wash the kumquats. Halve 4 and thinly slice the rest using a sharp chef's knife. Discard all the seeds and the white center membrane. Finely chop them. In a mortar and pestle, grind the peppercorns. Add the finely chopped kumquats and red Thai chiles until you get a thick paste. Add 3 tablespoons of butter. Mix until incorporated. Clean the chicken thoroughly. Get rid of the fat chunks near the bottom of the chicken. Leave the skin on. Season the chicken with 2 teaspoons of kosher salt and cayenne pepper. 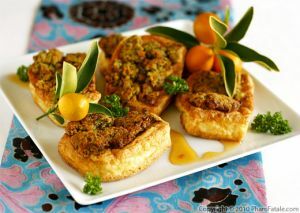 Mix the ginger garlic paste (or garlic), papaya paste, kumquat mixture and baking powder; be sure they're well-combined. Place the whole chicken on a large tray. Wearing gloves, carefully separate the skin from the flesh without tearing it. It's crucial for keeping the meat moist. Spread all the mixture under the skin, in the cavity and on the outside of the bird. Rub evenly. Drizzle with about 1 tablespoon of olive oil. Marinate in the refrigerator for at least 2 hours or overnight. You can marinate the bird up to 2 nights. 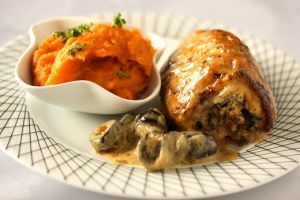 Remove the bird from the refrigerator at least 30 minutes ahead of time to bring it back to room temperature before placing in the oven. Place 2 whole shallots and the halved kumquats in the cavity of the chicken. Place the chicken in a roaster. Drizzle with a tablespoon of oil, then sprinkle a little salt on the bird. Cover just the tip and shoulders with foil so that they don't burn. Add the kumquat soda drink at the bottom of the roaster. Roast for 45 min. Remove the foil. In the microwave, melt some butter and the kumquat marmalade. Baste the bird with the butter mix using a silicone brush. Increase the temperature to 425°F for 15 min to brown the chicken. Take the chicken out of the oven. Loosely cover with foil (don't entirely wrap it or the skin won't be crispy). Let it rest for at least 10 minutes. 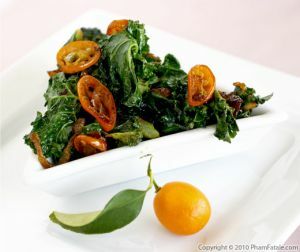 Serve warm with ginger kumquat sauce on the side (click on the link for the recipe). Garnish with fresh kumquats. I used kumquats from our garden. The zest is very fragrant. If you don't have kumquats, you could use other acidic fruits such as lemon, lime, orange or kiwi. I made my own kumquat soda (I'll post the recipe soon). You could use any other soda, such as Orangina. 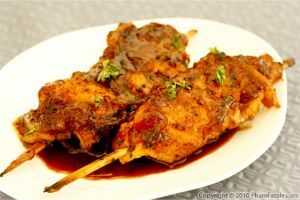 I use French, Vietnamese and Indian (citrus, baking soda, papaya paste) meat tenderizers to ensure juicy and moist poultry. Papaya paste was Baji, Lulu's late grandma's secret for tender meat. Peel a green papaya. Grind the cubed papaya with seeds in a blender, place about 1 tablespoon of papaya paste per slot in an ice-cube tray and freeze them. Transfer the ice-cubes 3 by 3 into sealable plastic bags and place back in the freezer. I think it's the best way to keep the same flavor without getting freezer burn. I store them exactly the same as I would extra pesto. Indian cuisine always calls for ginger garlic paste. It tastes great and is very healthy for you as well. Just clean a (2-inch) chunk of fresh ginger and remove any dirt. Peel the ginger root with a paring knife and finely chop it. Place the chopped ginger and 5 cloves of garlic in a blender and add about 2 tablespoons (or more) of water for a smooth flow. Transfer to a small jar and store in the refrigerator. You can keep this paste for at least a week in the refrigerator. At the end of the cooking time, if it's not golden brown enough, change your oven setting to broil for about 2-3 minutes. Published By: Jacqueline Pham on February 28, 2010. I don't think I've ever had kumquats with chicken before. Thanks for sharing!